This book presents a scientific, accurate, and thorough overview of the essential concepts of psychology in engaging language that the average reader can easily comprehend. 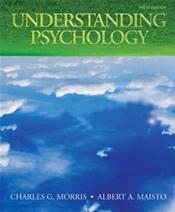 Topics include the science of psychology, the biological basis of behavior, sensation and perception, states of consciousness, learning, memory, cognition and mental abilities, motivation and emotion, life-span development, personality, stress and health psychology, psychological disorders, therapies, and social psychology. For anyone who is interested in introductory psychology.